I have to echo the sentiments of the cover quote: “I love all of Sue Moorcroft’s books!“. Last year she gave us the perfect Christmas read with The Christmas Promise and here we have a perfect romantic summer read with Just For The Holidays. A month’s holiday in a beautiful gite in Alsace sounds like a perfect way to spend a holiday doesn’t it? Well, not if you are Leah who has been asked along basically to keep the peace between her sister Michele and her estranged husband Alister. Only a few days have gone by when an unexpected pregnancy is announced and through an unfortunate combination of circumstances Leah finds herself in sole charge of her teenage niece and nephew. Much though she loves them, she has made a conscious decision not to have children herself and feels very out of her depth when it comes to parenting skills. In case she doesn’t have enough going on, living next door is very handsome helicopter pilot Ronan and his teenage son Curtis. There are lots of hormones swirling about and not just the teenagers! 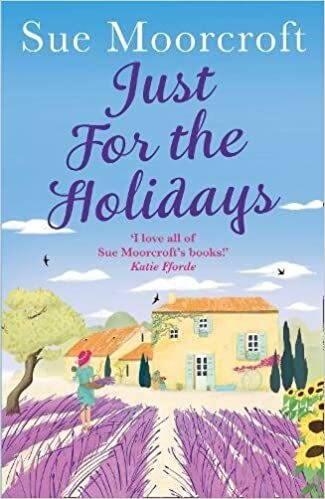 Sue Moorcroft writes books that quickly have me engrossed in her characters’ lives and Just for the Holidays was no exception. Her stories always involve situations which feel very real. Her characters have to face problems, dilemmas and worries. This makes the book sounds very heavy and serious but it’s not. There are a lot of light moments and laughter which very much reflect real life. Leah was someone I really took to. I loved the way she seemed able to relate to everyone and really connect with them. I was very jealous of her job tasting and developing new chocolates. Despite her doubts about her parenting skills she copes remarkably well with all the challenges thrown at her. She deals with problems in a very practical way, often heading to the kitchen to cook for and with the teens, showing her caring side through nourishing and nurturing even though she probably doesn’t think of it that way. The rather gorgeous Ronan was a great addition to the story. A helicopter pilot recovering from a shoulder injury, he seemed a very caring and considerate man. I thought his relationship with his teenage son Curtis was well depicted as he coped with the usual teenage moodiness and the boy who was quickly developing into a man with all the usual feelings and confusions of adolescents. In fact, as I was reading I felt that Sue Moorcroft portrayed all her teenage characters really convincingly. I had to laugh but also feel frustrated on behalf of Leah and Ronan as the teenagers seemed to thwart any opportunities they had to be alone together! I also have to admire the author’s dedication to her research which involved being taken up in a helicopter to simulate how a forced landing would be dealt with by a pilot – rather you than me Sue! Just for the Holidays is a really entertaining read and another winner from Sue Moorcroft. It’s a perfect mix of romance and humour, dilemmas and feel-good moments with such a perfect summery setting. Definitely one to read with a chilled glass of something fizzy as you relax in the sun (well we can hope can’t we?) and dream of summer holidays. My thanks to Helena at Avon Books for my copy – and my sunflower seeds, I’ll let you know how they get on! Just For The Holidays was published in paperback and as an e-book on 18th May. It is available in all good bookshops and at the time of writing is only £1.99 for Kindle, so treat yourself to this fabulous summery read – click here to order. Now read on for Sue suggestions of ten things you might consider doing – ‘just for the holidays’. If you and your loved one(s) usually find yourself bickering on holiday, outlaw arguing for the duration. Make crazy rules like people have to listen to each other’s point of view and be fair to all. Try a ‘staycation’ at home. Have picnics on the back lawn or even on the sitting room floor, jump completely out of your normal routine and don’t go to the gym, cubs, camera club or whatever constitutes your and your family’s ‘usuals’. Instead, go out for days to local places of interest you’ve never bothered with, go out for meals, have a duvet day or lie in the bath and read. Just don’t do the housework or the laundry. If the weather allows, have barbecues instead of cooking in the kitchen. Dye your hair blue. You can dye it back when you come home. Have a really, really, really good time. All holiday long. You deserve it. This sounds like the perfect read for summer.